Lynn was born to Levi Eldon and Fern Karns Butler on December 19, 1947, in Greeley, Colorado. After high school Lynn attended college at Northrup Institute of Technology in Los Angeles and Colorado Aerotech for Airline Mechanics. He married Ethel Jane (Crane) Lackey on December 7,1980. Lynn was a man with many skills and talents; his early working years were spent as an airline mechanic with United Airlines. He then began to his professional career as a passionate paramedic! firefighter and public servant. Lynn started as a volunteer with the Sheridan Fire Department in 1972 and eventually became the first person hired as a full time employee of the department. This picture of Lynn (on the left) was taken from a Sheridan Volunteer Fire Department photograph in 1975. 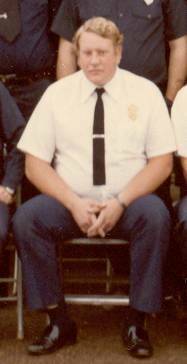 In 1978 Lynn moved to Sedalia, Colorado, and became an employee of the Castlewood Fire Department (now known as South Metro Fire Protection), where he served until 1999, at which time he retired from the department. Lynn owned a commercial trucking business from 1995 through 1999.during that time, he also served as acting Chief of the Jackson 102nd Volunteer Fire Department in Sedalia, CO, for a period of nine years. During his retirement he worked for a short time at the local WalMart, then with Douglas County School District driving a school bus, eventually becoming the bus scheduler, where he worked for the last five years. Lynn was a member of the Castle Rock Bible Church and was responsible for running the sound system for them for many years. Lynn loved music, boating, and animals. Preceding Lynn in death is his mother, Fern Karns Butler and his aunt, Mary Butler. Lynn is survived by his wife, Ethel; his father, retired US Air Force Lieutenant Colonel Levi Eldon Butler, Jr.; his sister, Jeanne and her husband, Mike Clark; and his Uncle, Graham Butler, of Greeley, CO.
Five children: son Michael from a previous marriage, and his wife, Jennifer; his step children, Curtis Dean Lackey and wife, Rhonda; Tina Jane (Lackey) Adams and her husband, Bobby; Cindy Lee (Lackey) Ramirez and husband Paul; Brandalxae Lackey. Twelve grandchildren: Jordan Butler; Michael Butler,Jr; Destiney (Adams) Summers and husband, Jason; Curtis Lacke, Jr; Jackson Lackey, Jr, and wife, Lindsey; Joshua Lackey and wife, Terice; Brandy Allena Adams; Naomi Jane Lackey; Wayne Lackey; Katie Lackey; and twins, Morgan and Abigail Lackey. Seven great grandchildren: Christopher Birner; Rhae Anna Bimer; Curtis Lackey III; Sebastian Lackey; Aristotle Lackey; Infinity Jane Lackey; and Ashlyn Lackey.